Cigars On The Porch: I Won Something...Again! According to Cambria, a good chunk of my recent stories have been along the lines of, "I never win anything, but I won this..."
You see, as a Rav-Hoar, I'm prone to just surfing about and finding interesting things. I found this lovely lady's blog and saw that she was raising awareness and donations for a very worthy cause. I was supposed to blog about it, but...well...yeah. I'm a lazy bum. John Wylie, a veteran stage actor in New York City, was in the original production of Grand Hotel on Broadway. While he was backstage, or during downtime at rehearsals, he loved to crochet. He became a recluse in his later years, and he passed away around the time my family moved into a home a few doors down from him. He left his house to his good friend Hal Robinson, who was in Grand Hotel along with John. Hal has been a most wonderful neighbor and friend over the years. One day he mentioned to me that he had a lot of “knitting stuff” that he’d like me to take off his hands. In the meantime, some movie producers came around our neighborhood, looking for a spot to film a new movie staring Robin Williams. It was called The Night Listener. While it wasn’t that great of a movie, it was exciting having it filmed in our little town, and we even got to meet Robin Williams. In fact, a good bit of the movie takes place in Hal’s house – Hal even had a small role in the movie. 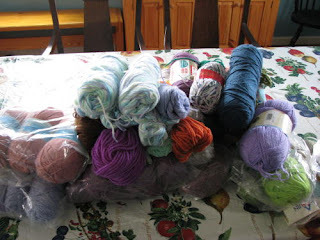 I cleaned out the “knitting stuff” from Hal’s home – it ended up being two large boxes of yarn, odds and ends, and A LOT of things that needed to be thrown out. I was surprised to see so many full skeins still in tact, and I knew that John would be delighted that his stash was going to such good use.